NEW YORK, NY--(Marketwired - November 30, 2017) - Consumers are deeply passionate about their gadgets, and they enjoy telling friends, family, and peers about their latest purchase or favorite brand. These conversations have a proven impact on future sales, and to help consumer electronics marketers better understand what consumers are talking about both in real-life and social media conversations, Engagement Labs has released its latest TotalSocial® ranking of the top-performing U.S. brands in the category. The analysis is a follow up to the Company's first ranking in April 2017 and is based on Engagement Labs' proprietary TotalSocial data and analytics platform, which is unique in that it continuously measures the most important drivers of brand performance in both face-to-face and social media conversations. 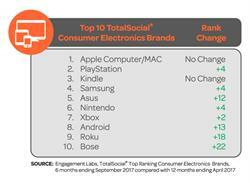 The brands in the top 10 have earned the highest TotalSocial scores in the category for the last six months. With its new noise-canceling headphones making headlines, Bose is making quite a bang in the category, moving into the top 10 for the first time. The brand accomplished the biggest gain in the category, accelerating 22 spots by improving its offline scores for volume, sentiment and brand sharing. In the time between Engagement Labs' analyses, Bose renewed its agreement with the NFL to remain its official headphone and headset provider and also partnered with Google to launch an updated version of its noise-canceling headphones. These activities increased positive consumer conversation offline about the brand. 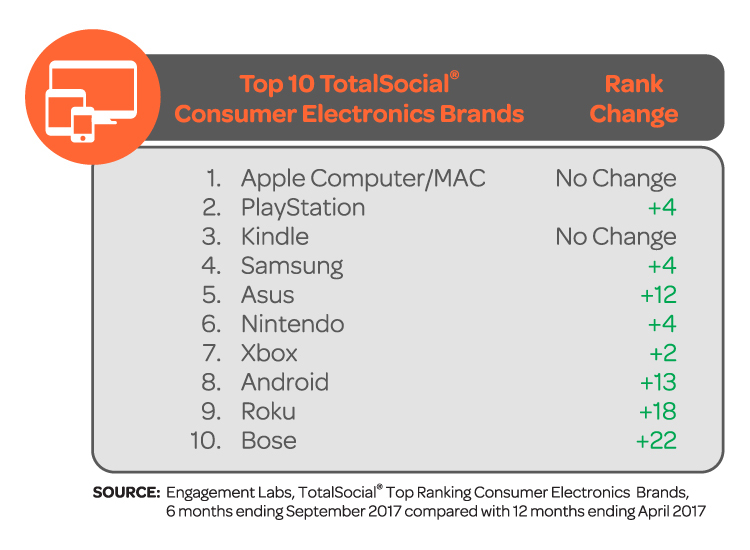 "Historically, consumer electronics companies have performed better online than offline, but a key takeaway from this analysis is that offline scores have started to outperform online scores for some companies," said Ed Keller, CEO of Engagement Labs. "More than half of the top 10 now have higher TotalSocial offline scores than online. In our previous analysis, just PlayStation and Samsung had stronger offline scores, but now Apple, Nintendo, Roku, and Bose can say the same. It's quite notable that Samsung, which climbed four spots to fourth on the list, notched a higher offline TotalSocial score than Apple this time around." Meanwhile, Apple held on to the number one spot due to its strong volume scores, both offline and online. However, some of Apple's products showed some weakness in its online scores as iPad, iPhone and Apple Watch -- all fell out of the top 10 over the last six months. The iPad's online sentiment -- the share of social media conversation that is positive about a brand -- fell significantly. Meanwhile, the iPhone experienced decreases in online influence, indicating the brand may be having a harder time connecting with day-to-day influencers. With the new iPhone X launching in time for the holidays, however, these scores could turn around as "everyday" influencers begin to share gift recommendations. Two other entrants to the top 10 made big gains in a short period. Roku, at number nine, moved up 18 spots, while Asus entered the list at number five, up 12 spots. Roku, which saw a 43 percent gain in subscribers from the previous year and launched its free ad-supported Roku Channel in September, saw improvements in brand sharing and sentiment both online and offline. Meanwhile Asus, recently honored as a "Rising Star" by the Global Technology Distribution Council, achieved big gains in their online influence score. Nintendo moved up four places to number six, largely due to gains in its influence score both online and offline. The videogame console company has seen record sales with the launch of its Nintendo Switch in March. Engagement Labs (TSX VENTURE: EL) is the world's first TotalSocial® company, offering intelligent data, analytics and insights for marketers. We are leaders in tracking, measuring and benchmarking the impact of conversations happening around a brand and industry -- both online and offline. Consumer conversations are a proven driver of critical business outcomes, including sales. The patent pending TotalSocial data solution provides brands with unique insights and powerful analytics to understand online and offline social impact and drive business results. TotalSocial demonstrates to marketers how their online and offline conversation compare and contrast and helps identify areas of competitive opportunity or significant emerging threats. TotalSocial is an "always-on" proprietary scoring system, based on the most important drivers of brand performance: Volume, Sentiment, Brand Sharing and Influence. TotalSocial was built on the pillars of Engagement Labs' patented social media measurement tool and the world's only offline word of mouth tracking system for brands and tracks 500 brands across 16 major industry categories within the U.S., and 350 brands across 18 industry categories in the UK.